I thought I would depart from politics and reflect back and share some of my Navy adventures. My 22 years in the Navy was in two forms, 10 years as Enlisted Jet Engine Mechanic and 12 years as an Aviation Maintenance Officer. I think I’ll post an occasional story mostly for insight for friends and relatives of what I did in the Navy. You may have seen something on TV or you have experience with US Navy Aircraft Carrier opertions, but the people working on the flight deck wear different color jerseys to signify their function on the flight deck. The visual communication is critical, since you cannot hear because of all the jet engine noise. A Sailor wearing a Brown jersey aka as a Brownshirt is a Plane Captain who is assigned a specific aircraft that you are responsible for, fueling, cleaning, moving, inspecting and sitting in it waiting for the next thing to happen during flight operations. There are Yellowshirts who are Flight Deck Directors and Blueshirts who are Aircraft Handlers…there are more, but this is good enough for this story. So, this is not me in the picture, but this what I was doing in 1978….I was onboard the USS Enterprise with my first experience as an “at sea” Plane Captain. I had done a few months on the beach, but the whole underway deal was quite different. So, there I was with my 6 tie-down chains and two wing-locks, Nose gear pin, and Main Landing Gear locks (for A7Es) about 125lbs of stuff. I was not yet trained for flight deck operations because we did not have time. So, the experienced guys said just watch others its easy you’ll get it. My assigned aircraft was 311. 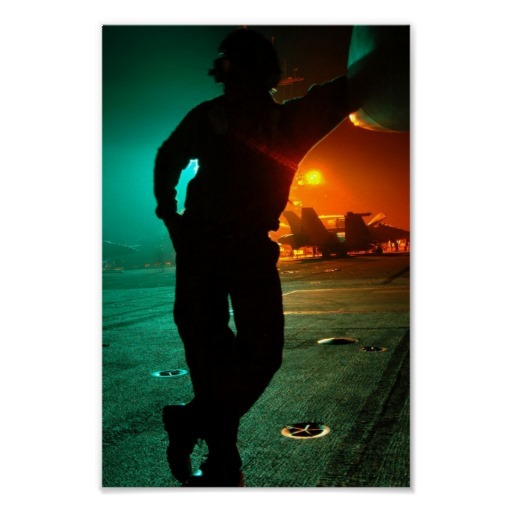 About 7 of us were forward of elevator 2 on the starboard side, in the catwalk waiting for our jet to land on the carrier, trap as the Naval Aviators say….The Air Boss announce the first aircraft inbound….Coarsir II, 311, 2 minutes out. My aircraft is the first jet to land. The Skipper was flying 311, he trapped and taxied all the way forward on the bow at the top of Catapult #2, the furtherest you can go forward on the flight deck. 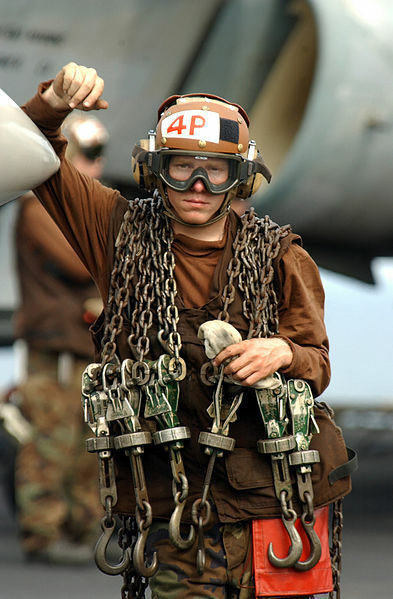 I got on the flight deck immediately and with my tie down chains and wing-locks started my way forward to my aircraft. What you first realize is that there is 40 knots (46mph) of wind coming across the flight deck. Carrying 125lbs and leaning into 40 knots of wind seemed crazy. But, you plow on. I finally get to my aircraft and the Yellowshirt is starring at me because I am overwhelmed and hesitant on what to do next. He points to the Blue Shirts and directs them tie the aircraft down. They rip the chains from me and tie the aircraft down. I install the wing-locks, main-landing gear down-lock on and the nose gear pin. All are very pissed and give me a push to make sure I understood their unhappiness with me. It’s very fast paced on the flight deck and everyone has to be good at their job.